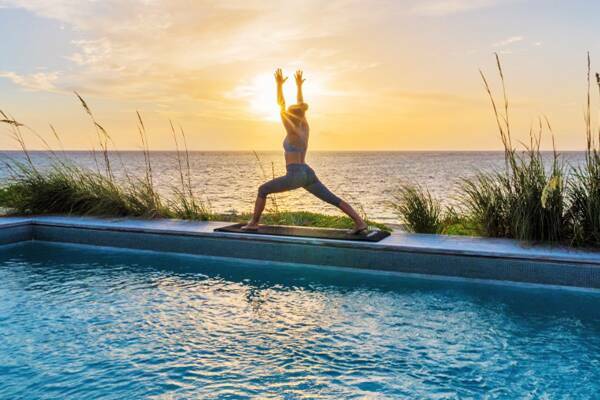 The luxury Sailrock Resort on South Caicos offers a wide range of wellness services, including a spa and yoga classes. South Caicos offers a more tranquil and peaceful environment than other islands such as Providenciales and Grand Turk. This is primarily due to the smaller population and generally low-density development. Cockburn Harbour is the main settlement on South Caicos and the airport and ferry port are located a short distance from the town centre. The island’s two spas are located at the two main resorts: Sailrock Resort and East Bay Resort. Sailrock Resort is located on the northern peninsula, and East Bay Resort is located on the southern coast of the island. There are two day spas on South Caicos: Na Spa at Sailrock Resort and Ayur Spa at East Bay Resort. Both offer a variety of therapies and packages. Na Spa at Sailrock offers ridgetop spa treatment rooms overlooking both the ocean and Bell Sound. A variety of 75 and 90 minutes packages are offered, along with manicures and pedicures. Ayur Spa at East Bay resorts offers a range of 30 to 90 minute packages. Both spas offer a mobile service available to guests staying in a private villa or at another property on the island. Ayur Spa offers treatments right on the beach for those interested. To make a reservation, simply contact the front desk at Sailrock Resort or East Bay Resort. Credit cards are accepted at both spas. Bookings are subject to a 12% Government Tourism Tax and a 10% Service Charge. It’s recommend that you advise your resort upon check-in if you’ll be using spa services to ensure availability. Remember to notify your spa in advance of any cancellations to avoid no-show penalties or other fees. 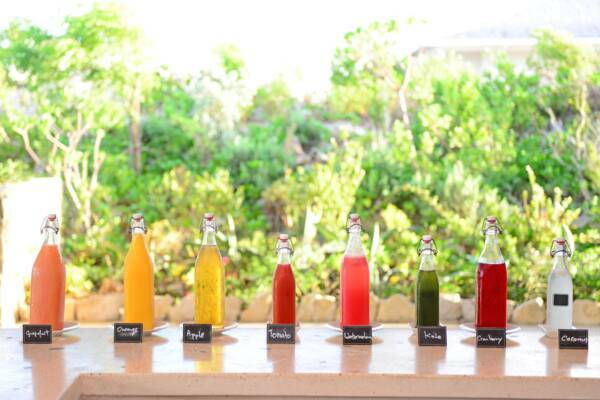 Fresh fruit juices at Sailrock Resort. Both Sailrock and East Bay Resort feature a gym for guests, featuring an array of weights and equipment. The fitness centre at Sailrock is complimentary for guests and also residents of the Sailrock Community. For those interested, Sailrock Resort also offers complimentary mountain bikes to guests of the resort which can be an excellent way to stay in shape (along with complimentary kayaks and paddleboards). East Bay Resorts offers scheduled classes during the busy season and by appointment. If you’re on a corporate retreat or in a large group, the yoga studios on Providenciales can easily arrange for a class on South Caicos. Na Spa is located at Sailrock Resort on the island's northern peninsula. A wide range of treatments are offered, including at your private villa or on the ridge-top cabanas.